Hey everyone! I hope you are all having a great Friday! My day has been jam packed...I woke up this morning and worked out for 45 minutes and burned 319 Calories. 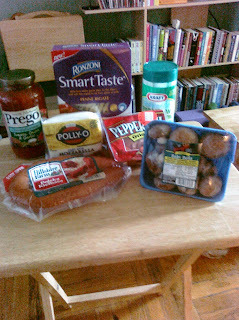 After I was done, I met my sister and niece and ran some errands. 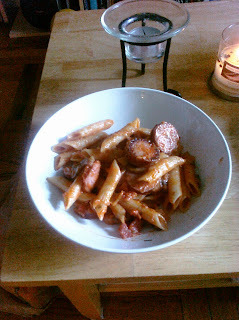 We all came back to my place and I cooked Lunch for us and it was sooooo ooooooey goooooey! 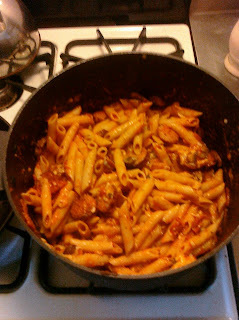 I made a huge pot filled with Pasta, Kielbasa, sauteed Mushrooms, Pepperoni, Part Skim Mozzarella, and Marinara Sauce. It was so good that I had to have 2nds. For bfast I made 100 Calorie Bagels with PB and Strawberries with Iced Coffee for my sister and I. We are watching "My Bloody Valentine" right now...have a great Friday!